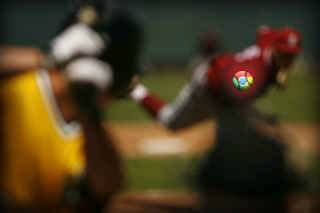 Home / GAFE / Google / "...and the pitch!" "Hey, Bob", said Dave wheeling his chair over to mine in our high school computer lab, "check out www.google.com! It blows AltaVista out of the water!" ...but I digress. The point is not that I've always been a Google/Gmail fan, but rather that up until last October at TechCon12, I had been blind to the massive following Google Apps had obtained from both local and international educational and corporate institutions. During the conference, Henry Thiele, Assistant Superintendent for Technology & Learning for Maine SD#207 in Park Ridge, IL, facilitated an outstanding session on Killing the FUD and Dispelling the Myths of GAFE. By the end of the session, I felt as though I was channeling my 7-year-old self on Christmas Eve. I knew that "Going Google" would be a game-changer for our district. But at the time, it was nothing more than a pipe dream. We were, and continue to be, a school district that has relied on the Microsoft Windows/Exchange environment. To get a real taste for the undertaking set before me, you have to realize that the average teacher or administrator in our district has a 3-5-year-old laptop running Windows XP, Office 2007 and Internet Explorer 8. Completely overhauling our infrastructure for the incredible intangibleness of a Chrome/Google Apps environment seemed like an impossibility. Still, I continued to fight for its worth. I made it a point to casually bring up the benefit of Google Apps on a daily basis, so much to the point that it became a running joke..."Yeah yeah yeah, Bob. We know, Google Docs solves all of life's problems." To me, this was a win. They remembered the correct terminology and admitted (albeit sarcastically) that Google Apps could be viewed as potentially superior to our current status quo. My colleague Catherine and I eventually convinced our Manager Dave (a different Dave than previously mentioned) that going Google could be in our district's best interest. Soon after, Catherine and I convinced our fellow coworker Dave (...yes, a 3rd Dave...), our eResources Administrator, to research and join us in advocating Google Apps for Education. And then, at the end of last week, we attended the Leyden H.S. Dist. 212 1:1 Summer Symposium. There, we spent three days on learning the ins and outs of Google Apps for Education, Chrome, and Chromebooks. Headline speakers Jaime Casap, Chris Lehmann and George Couros delivered inspirational keynotes on Education Transformation while teachers and administrators alike facilitated breakout sessions, showcases, collaborative work time, and student and teacher panels. Again, we left feeling the buzz and excitement over the possibility of one day being a GAFE district. Which leads me back to my first thought of this post. Today, for the first time during my career as an Instructional Technology Specialist, representatives from the various teams of our Technology Department met with our Tech Directors to discuss Google Apps. We pitched out ideas, explained our rationale, and answered their questions rather fluently. After nearly 90 minutes of discussion, Catherine, Dave, Dave and I (hereafter referred to as Team Awesome) returned to our office with a certain swagger, as though we just hit an RBI double to tie the game for Team Google. Tomorrow, our district's Technology Directors, Assistant Superintendent and Superintendent will be attending a Google Apps Leadership Conference. I'm praying that the hosts/facilitators at the conference do us the favor of making an overwhelmingly convincing argument for the adoption of Google Apps. Hit one deep to left field...out of the park even. Wave us on home!